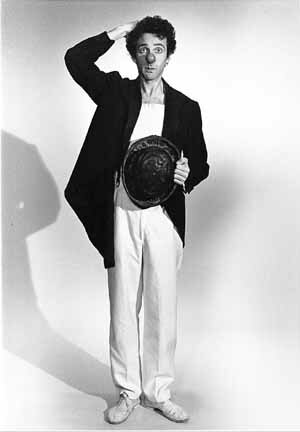 There hasn't been a clown Act like "Stanley Allan Sherman's Aero Show Featuring the Star-Spangled Banner" (at the Richmond Shepard Theatre) since Bill Irwin Rolled into town with his "Regard of Flight" a few seasons back. 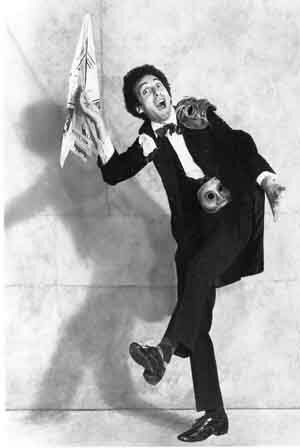 It's the same sort of thing, only different, where Irwin based his routines on the sawdust-and-tinsel traditions of the American circus, Sherman's are more closely derived from the commedia dell'arte style of European comic theatre. The results are nothing short of magical. In appearance, the lanky, bearded Sherman bears a striking resemblance to his sometime partner Avner Eisenberg (currently holy man in "The Jewel of the Nile"). The resemblance goes beyond mere physicality: the two studied together at the Ecole Jacque Lecoq in Paris and frequently share material. But the "Aero Show" is decidedly one-of-a-kind. There are no sets. Sherman enters the house from the rear, a sad-faced fool so slow on the take at first that it take him a second entrance to even acknowledge the audience. The show builds slowly, with an almost Chaplin-esque sense of comic construction as Sherman begins to examine the contents of a mysterious (and seemingly bottomless) paper bag that entices him from one corner of the stage. Quite literally, it's all in the bag. Inside are carefully tooled leather masks (Sherman himself was the artist) used to illustrate a gallery of characters, among them a wheezing smoker desperate for a cigarette and a whip-wielding clown killer. This could well be the most populated one-man show ever. But it's what's not in the bag that unlocks the secret of Sherman's artistry and makes the show so delightfully spellbinding. Sherman has the rare ability to breathe life into inanimate, even imaginary objects, wrestling with a recalcitrant coat when it fails to stay on an imaginary hanger and then administering CPR when it "expires." You can't even see some of the funniest bits-but you think you can. Audience participation is an important factor here. Sherman doesn't so much play to the house as with it, and it's hard to imagine a more engaging playmate. Again and again Sherman dissolves the traditional barrier between performer and viewer with a good-natured, childlike innocence that's difficult to dislike. He isn't just a performer-he make us his friends, as well. It all leads to the show's climactic set-piece, an irreverent salute to armed forces battle hymns that finds Sherman pulling paper soldiers out of the bag to the tune of "The Caissons Go Rolling Along, dousing himself with cups of water during a rendition of "Anchors Aweigh" and sending paper planes-equipped with parachutes no less-sailing into the house for the tribute to the Air Force. The routine culminates in a truly explosive, on-your-feet version of the national anthem to which Sherman provides accompanying special effects. Ramparts gleam rockets glare, talcum-powder bombs burst and red-white-and-blue toilet-paper streamers fill the house. Rambo might object, but for the rest of us it's likely to prove the perfect finale to an already in-flight "Aero Show." Whimsy and serendipity are Stanley Allan Sherman's Trademarks. His "Aero Show" which opened last night for a three-day run at Ohio State University, makes much of little. Sherman flies paper airplanes, dances with a peacock feather, tries on masks and juggles toilet paper rolls. For Sherman, even something as simple as walking on-stage can be a rich source of extended entertainment. 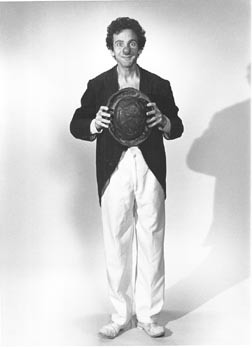 Sherman's clowning and miming hilariously blend existentialism and patriotism, commedia dell'arte and performance art. Simple but subtle, he captures a child's innocent, inquisitive spirit. Like a 6-year old, he blossoms under the sunshine of attention. Then more the audience responds, the more he gives. Parents, take your kid! If you don't have any, that's no excuse. Borrow a few. Anyone who doesn't grab the whole family to see this weirdly wonderful fellow deserves to be arrested for criminal negligence. His show is that special. 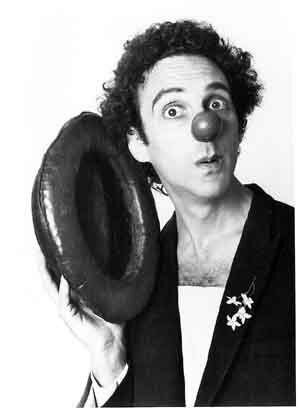 Sherman's surprise-filled variety act also launches OSU's month long Clown/Mime Festival. Other public performances include puppet shows (July 17), Luftkugle Lecture with J. Edmond Daly's Bharata Natyam dance (July 15-16), Avner the eccentric (July 22) and more. Sherman's zippy performance raises high expectations. The rest of the Festival is going to have to be darned good to live up to them. Copyright © 1976-2011 Stanley Allan Sherman. All rights reserved.